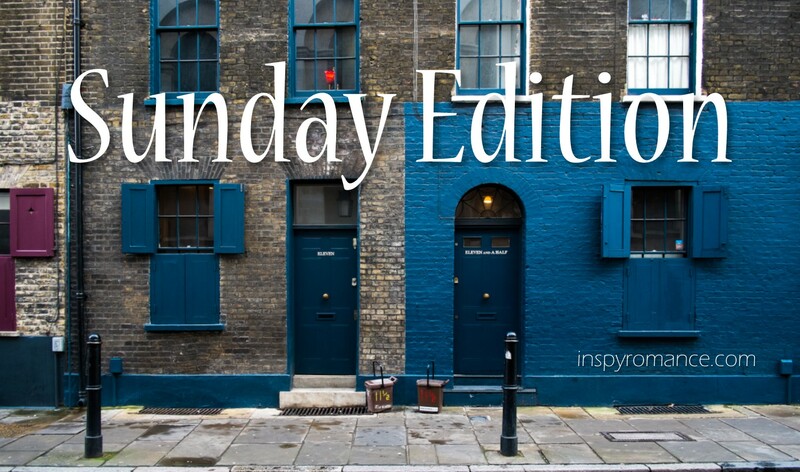 Welcome back to the Sunday Edition! I hope y’all have had a great week! Mine’s been…stressful. So, I got to thinking about where I’d like to go to get away from it all for a few days. The beach, of course, would be fabulous. But as I was scrolling through the stock photos I have, I found this one… It’s in London which is somewhere I’d LOVE to visit. I’m sure there’s some significance to the doorway numbers, I have NO IDEA what it is. But it kind of looks Tardis blue so I went with it ;). So I hope there’s nothing…off about it that I’m unaware of ;). Where would you like to go to rest and recharge for a bit? As always, we have winners! AND there’s some big news down in the News & Notes section! Lee Tobin McClain’s winner is Diana! Ginger Solomon’s winner is Robin Mason! And winners from the SUMMER GIVEAWAY! HAPPY NEWS!!!! Krista Phillips has signed with Barbour Publishing for a novel to release next fall!!!! Check out her announcement on her Facebook page! I also think that house looks like Tardis. That’s something I’d love to see but not sure about traveling with it (definitely not to get some rest). Speaking of resting, my husband and I took our first (real) vacation in 6 years in the Adirondacks. It was so lovely and peaceful. I thanked God everyday for creating the nature (lakes, mountains, trees..) that surrounded us. Living in SW Michigan and being retired to recharge for a bit, I drive a mile to the beach. Lake Michigan is ever changing. Some days calm and some days stormy. We have beautiful sunsets and often see the skyline of Chicago over 90 miles away. When the weather is bad we have a talented photographer, Jason McIver with an excellent telescope lens, who posts beautiful pictures of our beaches on Facebook. My husband and I enjoy road trips to see vineyards and orchards and at this time of year lovely fall colors. Michiganders are blest, we may not always say that in the depths of a cold snowy winter. In retirement every day is a vacation. Otherwise I love to visit the Smoky Mountains. My favorite countries are Germany, Switzerland, and Austria; but not sure I am up to an eight hour international flight any time soon. If I could get away I’d go to the Oregon coast. I try to go at least once a year. Even when it’s reading and stormy it’s still a great get away. We’ve toyed with the idea of getting a house there, but the up keep would be too much. I live the idea of just sitting watching the waves, hearing the power of the waves, and knowing God is the one who controls it. He controls my life too so I can know He’s got it covered. Both beach and mountains are good get-aways for me! My daughter’s family is out on Vancouver Island this week, at my very favorite place on Earth. I wish I could have joined them. Not that they asked – they’re grownups, after all, but that doesn’t stop this Mom/Grandma of being a wee bit jealous. Thanks so much for doing Sunday Editions in September, Carol, and I hope you can find that internal getaway you need. Many hugs. If I could get away,I would like to take my husband to San Francisco. Right now is dove hunting season, so I would love to be in the middle of nowhere Kansas, hanging out with my daddy, sitting in a pasture next to a windmill, listening to the bugs and the wind in the cottonwoods, watching all the different birds that fly by or come get a drink in the windmill puddle, and looking at all the really pretty plants (and getting covered in ragweed pollen and sand burrs in the process, haha). If I happened to bag a few birds in the process it would be a fun bonus! Congrats to the winners this week. Looking forward to another great week on Inspy Romance!